Uttar Pradesh, Madhya Pradesh and Rajasthan are the only states where poppy can be legally cultivated but poppy cultivation for non prescription drug manufacturing is a crime and present phenomena in Arunachal Pradesh. Mostly, cultivation of poppy is done in Lohit, Tirap ,Changlang and Anjaw district of Arunachal Pradesh. In fact, one can hardly find anyone in these districts not involved in poppy manufacturing. The main reason of cultivation of poppy is rampant unemployment. The people of this region have neither any job nor land for farming. 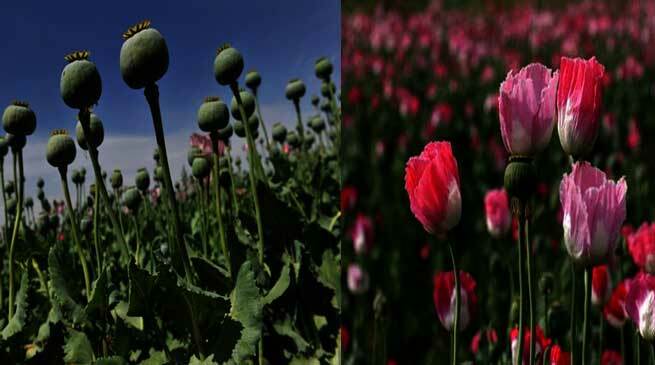 Many don’t know that the cultivation of poppy is illegal. The principal concern for these people is to earn a decent income to support their families. They don’t have the full knowledge of law nor are they afraid of any law, says Singhya Namam, a local who earlier used to cultivate poppy. According to an estimate, 150-200 tonnes of poppy is cultivated annually in Arunachal Pradesh and 4-5 grams of it is consumed by the locals every day. Such large scale production and consumption of poppy is unlike any other in the country, but lack of a clear anti narcotics policy and anti drug laws have handicapped authorities to solve this crisis. The Doctor of Lohit, Satilam Naeel says that “The consumption of poppy is as ubiquitous as its production”. Even the awareness programme for controlling the consumption of poppy has also proved ineffective here according to the doctor. in year 2012–13 , about 299 acres of popyy cultivation was destroyed. in 2014-14, about 335 acres was destroyed. It is not as if the government is not taking any steps to stop poppy cultivation in Arunchal Pradesh, During March- April when the time comes for cutting of poppy then The Narcotics control Bureau organises a round in these areas for destroying the fields only to face stiff opposition from the locals who see it as a threat to their livelihood. According to one of the Officer of Narcotics control Bureau of Lohit and Anjaw, Whenever their team goes for destroying the poppy fields, they have to face many problems, the local people block the road by burning tyres. Sometimes they have to use force while dealing with them.